Outline of Yarrow Reservoir overlaid onto old mapping showing what was replaced in the construction. Anglezarke, Anlezark, Anglezark… The name Anglezarke is derived from two Norse-Gaelic elements. In the first part comes from the name Anlaf, a form of the popular Scandinavian personal name of Olav. In the second part comes from the Old Norse word erg or the Brythonic word cognate with Gaelic word àiridh (dialectal arke or argh) both meaning a ‘hill pasture or shieling’. The two elements together mean ‘Anlaf’s hill pasture’ – i.e. ‘the hill pasture belonging to Anlaf’. The earliest spelling of the name was in 1202 when it was recorded as ‘Andelevesarewe’. By 1225 this had become ‘Anlavesargh’, in 1351 ‘Anlasargh’, and by 1559 ‘Anlazarghe’. 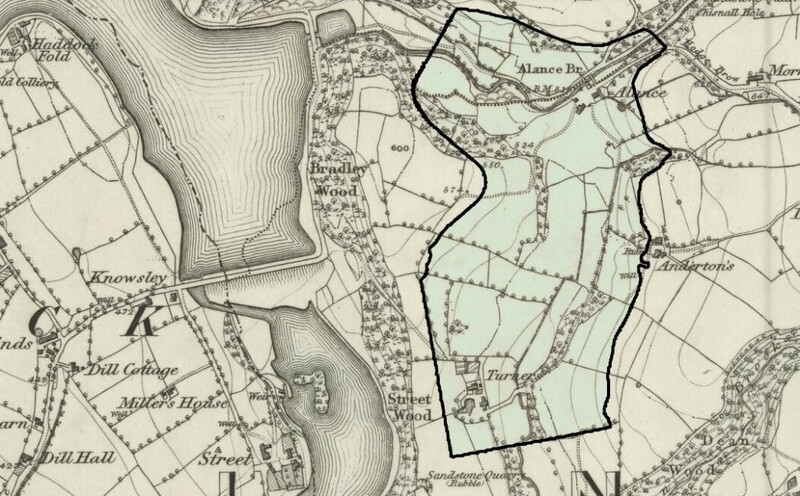 Our maps, starting in the 1700’s, first reference ‘Anglezark’ and it is only in the 1900’s that we first see the modern spelling, ‘Anglezarke’. In 1894, there were plans to join Anglezarke to Heapey, but ratepayers protested sufficiently. There is an alternative history to the name. According to a book I discovered in the British Library, Anglezargh may mean Heathen Temple. The first portion indeed includes the name of a Norse deity, although people did name themselves after deities. Anlaf’s Argh = The Temple Of Anlaf The Heathen. Death on 13th October of Robert Charnock due to a fall of stone in a quarry belonging to Thomas Pilkington. The Inquest took place at the Black Boy. He was 27.
mark the spot of his demise. United Utilities now own Moses Cocker Farm having bought the owner out. I think it was due to animal waste pollution running into the reservoir over time and (so I heard) that the farmer was given an order to clean up the waste with a fine or sell for market value ( he chose the latter). The farm is occupied by tenants (non farming). Simon thank you, I will update the Moses Cocker’s page accordingly. Mark I have also e-mailed the following details about Samuel Pilkington to you. Samuel Holt b 1809 Anglezarke. He was born on 2 Mar 1809 and baptised on 13 Jun 1809 at Rivington. Samuel Pilkington – son of Thomas Pilkington and Mary Vause firstly married on 22 Jan 1844 his cousin Jane Pilkington , daughter of Samuel and Betty Ainsworth – she was the widow of Charles Holt and they had Holt children Betty 1825, Ann 1828, Alice 1830, John 1834, Sarah 1836 and Charles 1840 all baptised at Rivington. Charles Holt Head 35 Farmer and Quarryman Lancs. Jane Holt Wife 35 Weaver Lancs. Betty Holt Dau 15 Weaver Lancs. Alice Holt Dau 10 Winder Lancs. Sarah Holt Dau 5 Scholar Lancs. Charles Holt Son 2 Lancs. At this time  Samuel is still unmarried and living at Stones House, Anglezarke with his widowed mother Mary and brothers Thomas, Ralph and Joseph. Charles died in 1843 and Jane then married her cousin Samuel Pilkington on 22 Jan 1844, they had a son Thomas in 1844, then Jane died in 1845. Samuel then remarried on 18 Jan 1847 to Ann Holt his step daughter – there was 19 years between them. On the 1851 census at Simms Farm – the two youngest Holt children have the surname Pilkington. Charles Holt/Pilkington reverts back to Holt as an adult. Samuel Pilkington Head 52 Farmer of 112 Acres of land Anglezarke, Lancs. Ann Pilkington Wife 33 Care of House Anglezarke, Lancs. Charles Holt Step son 21 Quarrier of Stone, Anglezarke, Lancs. Thomas Pilkington Son 16 Shepherd Anglezarke, Lancs. Joseph Pilkington Son 12 Scholar Anglezarke, Lancs. Mary Pilkington Dau 7 Scholar Anglezarke, Lancs. Sarah Jane Pilkington Dau 5 Scholar Anglezarke, Lancs. Abel Pilkington Son 2 Anglezarke, Lancs. Samuel Pilkington Head 62Farmer of 180 acres of grassland Anglezarke, Lancs. Ann Pilkington Wife 42 Farmer’s Wife Anglezarke, Lancs. Thomas Pilkington Son 26 Farmer’s Son Anglezarke, Lancs. Samuel Pilkington Son 24 Farmer’s Son Anglezarke, Lancs. Joseph Pilkington Son 22 Farmer’s son Anglezarke, Lancs. Mary Pilkington Dau 17 Farmer’s Daughter Anglezarke, Lancs. Abel Pilkington Son 11 Farmer’s Son Anglezarke, Lancs. Lucy Pilkington Dau 7 Scholar Anglezarke, Lancs. Ann Pilkington Dau 4 Scholar Anglezarke, Lancs. Amelia Pilkington Dau 11 mths Anglezarke, Lancs. Charles Holt Head 32 Farmer of 13 Acres Anglezarke, Lancs. Grace Holt Wife 33 Sharples, Lancs. Jane Holt Dau 7 Scholar Anglezarke, Lancs. Abel Holt Son 5 Scholar Anglezarke, Lancs. William Holt Son 4 Scholar Anglezarke, Lancs. Grace Holt Dau 2 Rivington, Lancs. In 1881 Charles and family are living at Old Kate’s and in 1891 at Brook House Farm. Charles died on 25 Jan 1895 and is buried at Rivington Presbyterian Chapel. Samuel died in Feb 1887 and was also buried at Rivington Presbyterian Chapel on 9 Feb.
@LeeAlty Litter pick from yesterday, ready for arranged collection?